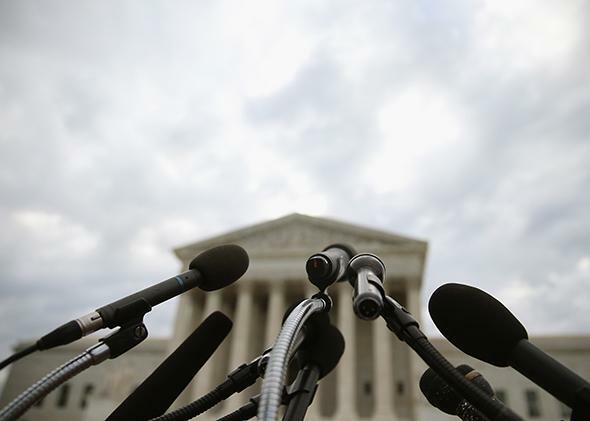 The Supreme Court term could have been a lot worse, but it was still pretty bad. For humans. The term could have been a lot worse, but it was pretty bad. The more I think about it, the more I think this term will go down as the “thank you for not looting” term, more than the “it could have been worse” term. I understand that we are grateful that the court is inching right as opposed to hurtling there. But this is about the big picture, not the pointillist one. While I, too, am grateful that the court didn’t go in for the kill this term on public sector unions, or the regulatory authority of the EPA, or the scope of executive power, I think that planting a seed for the next case to come along and do so can’t be scored as a win, either. The five conservative jurists didn’t quite drive a stake through the heart of campaign finance laws or pull the plug on affirmative action. But they are getting there. And the problem with incremental change, when it is all in the same direction—driving more and more liberty, authority, and “dignity” toward employers, the wealthy, and deregulators—is that we can’t always see it. I don’t believe for a minute that a court that has taken up arms in a decades-long religious culture war thinks that a decision in Hobby Lobby to bolster the religious liberties of corporations over the objections of their employees stops at the contraception ban. We will be living in Hobby Lobby’s shadow for many years to come. And it’s not just about Hobby Lobby or McCullen. I find myself worried about a court in which five members are convinced that we sorted out all those pesky race problems in the ’60s, and that women need to be “gently counseled” before they can make a medical decision. (We don’t need “sidewalk counselors” to tell us about “botched abortions.” We have Google.) I worry that this court finds women’s health concerns so unserious that it won’t even engage in a meaningful discussion about them. (It does not afford me great comfort when the court assumes, without explaining, that women’s health care is probably important for argument’s sake, the way Ricky did with Lucy back in the day). I have come to the point that, whenever I read the word dignity in a majority opinion, I start to flop sweat. Because the majority doesn’t spare a lot of worry for the dignity of one-half the parties in these cases; the alienation of religious minorities who must sit through sectarian prayers; or the minority students at public colleges; or the voters who feel their voices are drowned out by billionaires in election contests. I worry that some of the justices blind themselves to the ways DNA exonerations have changed everything when it comes to the death penalty, or to the actual needs of a minimum wage worker whose doctor believes she should have an IUD, or the facts that led the mostly women in the home care industry to unionize in Illinois. There is a big old world out there full of ghost people who are often dismissed with a footnote, as the court waxes eloquent about the “dignity” of non-people—states and for-profit corporations. I thank all of you for taking time during what, for Supreme Court watchers, really is Oscar week, and for sharing your thoughts and insights. It is always a pleasure and this year, more than ever, reminded me of why. Have a good summer.